1 of 5 Heat oven to 425 degree F. Spray a baking sheet with nonstick cooking spray. 2 of 5 Crush crackers in a plastic bag. Add cheese, oil and basil. Shake to combine. 4 of 5 1/2 tablespoon of the mustard and season with the salt and pepper. Press the cracker mixture onto the mustard-coated side of the fillets. 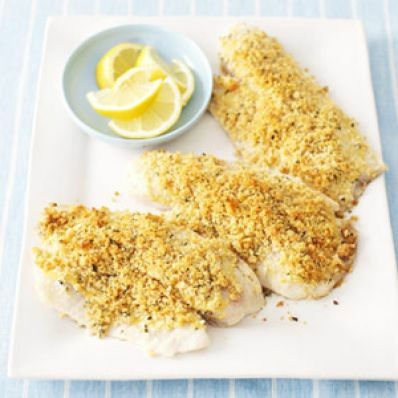 5 of 5 Bake at 425 degree F for 15 minutes or until fish flakes easily with a fork. Serve with lemon wedges and tartar sauce, if desired.